Bold orange is mounted within a sturdy silver frame on these orange cufflinks. They're the perfect solution when you need something bright and shiny to accent your outfit. Add them to your favorite French dress shirt and enjoy the added orange at your sleeves. Each central stone is an orange catseye with varied color tones. They're coated with a protective covering for added durability over time. It's 11/16" in diameter, making it slightly larger than most standard cufflinks. This set looks much more expensive than it is and if you're the type of person who enjoys wearing orange, you'll want to add these cufflinks to your collection. 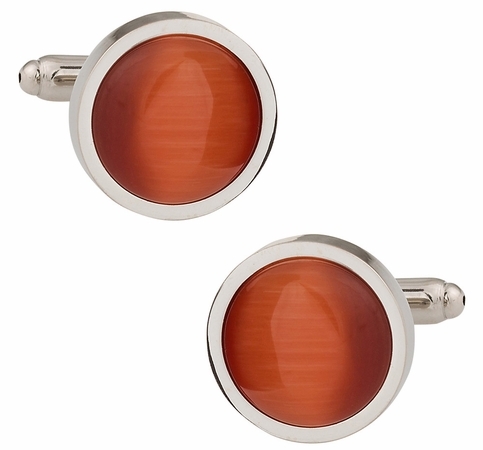 These cuff links have a traditional, round shape, but the orange colored stones add a little bit of style and fun to the accessory.